This majestic tree attains a height of about 20 meters and his vigorous trunk with a silvery grey bark, full of little bursts, surpasses often 2 meters in diameter. His large branches procure a much appreciated shadow during the hot summerdays. The tree blossoms in May and June. Gathering of the chestnuts take place in October and November. When the chestnuts have been gathered, in the Castagniccia, around Bocognano, Evisa, Ajaccio and some other areas (Deux-Sevi, Soro, Haut-Taravo, Prunelli) in the months of October and November, the great work of working up the chestnuts follows. They dry and grind them in order to make the famous chestnut-flour, used in cakes and pastries, bread, nougat and in lots of delicious dishes. Try the delicacy "marrons glaçés" for example. Dont't forget the pulenda, a sort of porridge, made since ages.The honey, the liqueurs, even beer! You can buy the flour on Corsica in shops, which sell Corsican specialities, but also in some supermarkets. And of course on the special fairs. You can take it home, but do store it in the refrigerator! As protecting and feeding trees, the chestnut-trees have played an essential role in the history of many mediterranean people. In all European languages the Greek term "kastana" indicates, that u castagnu was undoubtedly unknown in the Mediterranean area before its arrival in the antique Greek territories. Slowly the "arbre à pain", the "bread-tree", began to grow on the coasts along the "Mare Nostrum". In Corsica, the presence of the chestnut-tree has been mentioned since the beginning of the XIIIth century. Although palynology (study of pollen) showed its presence since the Neolithicum. It's the start of a long history, which will deeply mark the society, the economy, the daily life, food and the landscapes of the Ile de Beauté. A history, that is marked nowadays by a renewal and a diversification. From 1284 - 1729 Corsica was dominated by the Genoese. In 1584 the Governor of Genua decided that all farmers and landowners on Corsica had to plant four trees yearly: a chestnut-, olive-, fig- and mulberry-tree. The economy, and with the economy the political, cultural and social life of the Castagniccia, the most important chestnut-area, began to flourish from the XVIth century on. 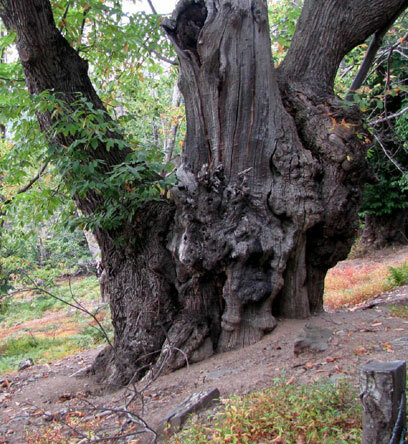 Lots of villages owe their origin and their former richness to the chestnut-woods. At the end of the 17th century there were already 100 inhabitants pro square kms. 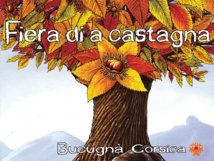 Around 1770 the surface of the Castagniccia was covered by 70% of chestnut-trees. Because the chestnut-flour was an important article of food, the tree was also called, as said: "arbre à pain". The hard, durable wood was used for a.o. furniture and whine-casks. At the end of the XIXth century the Castagniccia was overpopulated. But then the emigration to the colonies started and afterwards the terrible losses of young Corsican lives during the First World War caused the decline and abandon of the woods. Illnesses of the trees did the rest. But now, after a lot of vicissitudes the more than 3000 productive hectares are in full renovation. The Collectivité Territoriale, the Government and the European Community have engaged in a big plan of regeneration for a 1000 hectares within a few years. The yearly harvest is about 1200 tons of gathered chestnuts, of which 85% is transformed in more than 300 tons of flour, sold and consumed on the island. The species that is seen most, is the "castanea sativa", but on the island more than 60 varieties are found, according to their environments. Thus each is representative for a region and, according to the taste, its flavour is destined to a very special use: direct consumption (boiled or roasted), transformation into flour, conserved, confectionary, pastry, confiserie, pâtisserie or animal food. Generally during the month of August they start the preparation for the harvest. The soil underneath the chestnut-trees has to be cleaned from everything, that could have grown since the harvest of the year before. From the beginning of October, the course of the harvest vary according to the species, depending on their ripeness and the destination of the fruits. 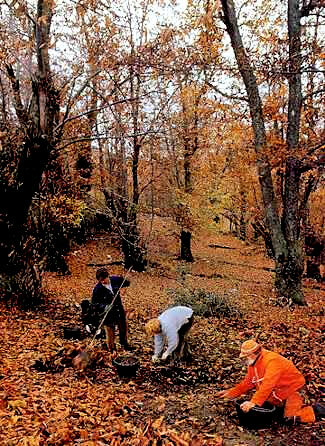 Traditionally just the chestnuts, fallen on the ground, out of their shells, are gathered, with the help of a short rake, u ruspatoghju, the gatherer searches between the leaves. The gatherer, u cudditore, puts them carefully in his basket, a sporta, u spurtellu. 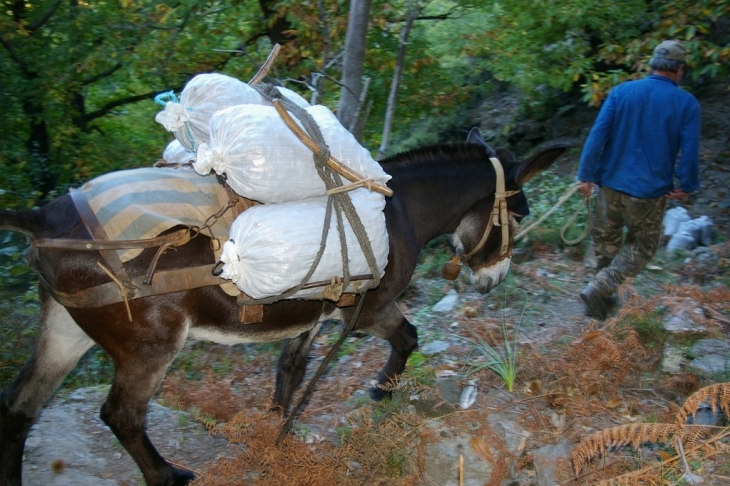 Helping hands from the village people are very welcome and mules are indispensable on the slopes, to transport the chestnuts. Once the harvest has been done, the chestnuts are put on the drying-loft, u grataghju, where they are put on a lathwork on a certain height over a constant and slow fire, u fucone. This fire will burn about 25 days and thus slowly dries the chestnuts, which are stirred a lot of times during the week, in order to get a uniform result. People have to work for hours in a smoky drying-room. The control over the fire is a question of experience and perseverence. After the drying, the chestnuts are put in a threshing machine, in order to shell them. Then they are put in a blowing machine, to remove the last skin. This skin contains a lot of tannin, a lesina. The more tannin, the more bitter, so that they have to remove the last tannin with a little knife to get the best quality of the fruits. In this phase the chestnut can be eaten as a delicacy with a highly appreciated flavour. Then they are put, in little quantities, in a riddle, where they are sorted out one by one. Every imperfect chestnut is removed, to get a very good quality. Afterwards they are transported to the traditional hydraulic mill, where the fruits are heated in the oven, and then pulverized by the big mill-stones. The flour, thus obtained, is very fine and light. In the 19th century there were lots of mills, mostly watermills, which were used for the corn as well as for the chestnut. There are probably still two grinding watermills left. The way of grinding doesn't make any difference for the flavour of the flour. Not only men are fond of chestnuts, pigs love them as well! Many pig-breedings have been started in the past. There are still the half-wild, legendarian Corsican pigs, wandering in the chestnut-woods,and along the roads, looking for the fallen fruits. The so called "porcs coureurs". Their meat is much appreciated by the gourmands as well: like the coppa, lonzu and figatelli. During the gathering of the chestnuts proclamations from the mayor are nailed on tree-trunks prohibiting farmers to let their cattle roam free; pigs, sheep, goats and cows must be kept in their enclosure so that they will not disturbe the gathering. Years ago the chestnut-flour was an important product in the exchange by bart, very common in the special economy of the Mezzogiorno (the area of Corsica, Sardinia, Sicily and the south of Italy). It is characterized by a relative underdevelopment. Flour in exchange to olive-oil, wine, cheese, meat, citrusfruit, etc. mutually. You still find it in some form on Corsica. The flavour is sweet-smelling and uncomparable.It has a light beige colour in the Castagniccia and is darker in other regions. 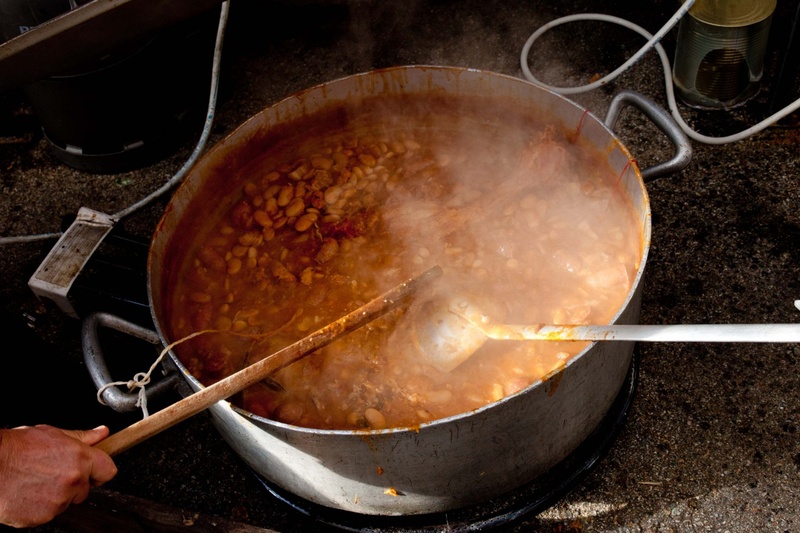 Thanks to the flour the gastronomes feast upon the famous and ancestral pulenda, warm porridge served with fresh milk, or the subtle granaghjoli. Gourmands and gastronomes can taste as well the succulent "marrons glaçés", liqueurs, cakes, honey, jam, nougat, frosted desserts and even beer from chestnuts, all Corsican! The chestnuts used come from the most beautiful and highest chestnut grove in Europe, located in the Castagniccia, at an altitude of over 1,000 meters. Every autumn the fruit is hand-picked, transported down the hill on donkeys and sorted by hand. This guarantees flour of a very high quality, from a totally natural environment, flour having the Organic label. Highly fermentable, chestnut flour has an excellent impact on the quality of the head and gives beer its beautiful coloring. Mixed into the malt during the mashing process, the chestnut flour is a prime ingredient and not just a flavoring. Chestnut flour does not provide a specific taste, but the end result is remarkable in every respect: a very original bitter tart attack, a lingering aftertaste and very thirst-quenching. 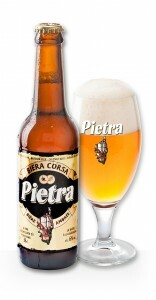 An authentic creation for specialty beers. to promote the products of the chestnut economy, such is the objective of the organizers of this demonstration whose spearhead is the chestnut of Evisa: Insitina varieties of chestnut offering the characteristic, in addition to its distinctive value, not to present any bulk-heading. In addition the mushroom is associated with this festival. 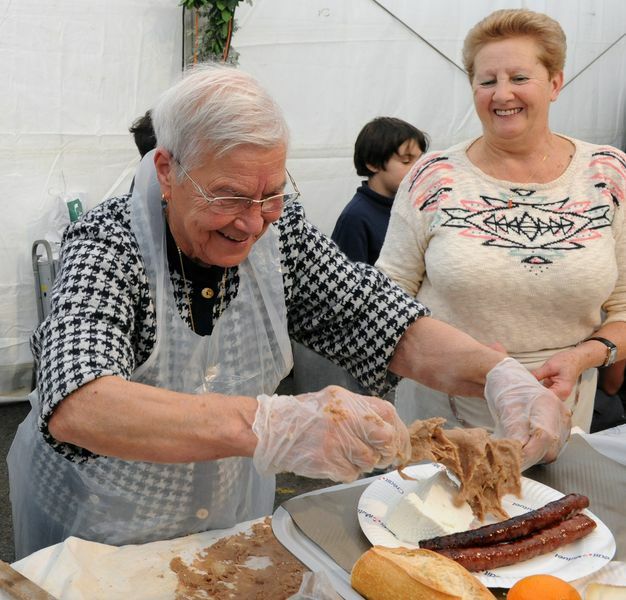 The chestnut fair considered to be Corsica's largest regional fair, organized by professionals. The chestnut and its different uses are honoured on this occasion, and there is a regional chestnut flour contest. In the folds of its bark the big nourishing tree has stored a lot of dreams and legends. Dorothy Carrington in The Dream-hunters of Corsica: "Trees might also be vampires. 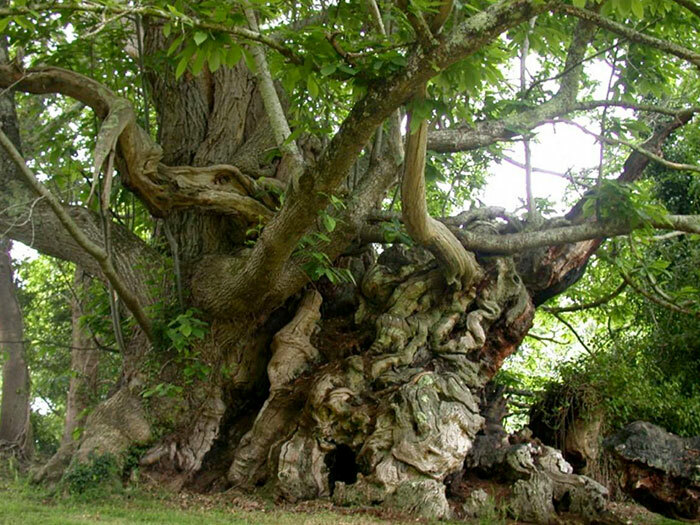 According to tradition a chestnut-tree in the sumptuous valley of Spelunca snared passing travellers in its branches and sucked away their blood". But more than ever like a sanctuary, a real symbol of protection, the magnificent u castagnu forms a great part of the patrimonial heart of Corsica. As I could'nt leave you without the lamentu in the story about the olive-tree, you can't either do without the Lamentu di u Castagnu, the lament of the chestnut-tree! Composed in 1926 by Anton Battista Paoli, called Paoli di Tagliu (1858-1931), this song expresses the ingratitude of the Corsicans. The Corsicans, who, having new economic motives, give the tree, that fed them for centuries, to the wood-cutter. See the comparison with the Lamentu di l'Alivu! However, as this lament counts 27 strophes, I will just let you know some of them. As I had different sources, the sequence of the strophes may not be exactly the right one. Anyway, the message is clear! Versi mè si senza core. Quandu lu fruttu hè maturu. O Corsu, sì cusì duru! N'hè pienu strade è stradoni. Era Corsu un gran festinu! Corsu, di li tempi andati? And without the least debate. Who caused my body cold perspiration. You have really no heart for me. When the fruit is nearly ripe. Oh Corsican, you are so hard! Full of mules, dogs and carts. Because his mill was filled. My fruit was a big feast! Always assaulted by so many ennemies? MAL'CUNCILIU,nom du légendaire châtaignier séculaire, à la forme effrayante, en Castagniccia. Il réveille de vieilles terreurs. A son pied se réunissent les Mazzeri, Bergers de la Mort, jeteurs de sorts, sorciers étranges et mystérieux, doté de pouvoirs surnaturels. Sous ses branches se tient le Conseil des Filles du Mal à l'influence maléfique. A carezza o lu spenventu."